Happy Monday to you! 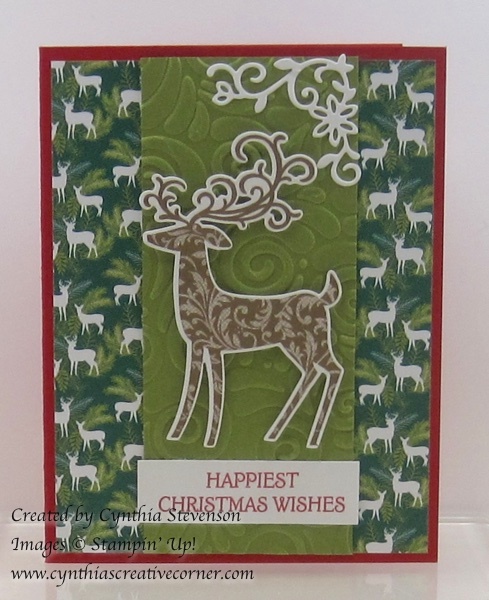 Today’s post features the happy stag from the Dashing Deer Bundle(yes I know, again) which is another of the cards we will be making in this Tuesday’s card class. The Under the Mistletoe designer series paper has 2 pages full of deer images so I thought that they’d be a great background for this beautiful stag! Cutting him out was easy with the matching Detailed Deer Thinlits dies. You save 10% when you purchase the bundle! See the products that I used below. Have a great day and Happy Stamping to you!